The new Mazu 42 ST is specifically designed to carry her owner to business and social appointments around the city, avoiding the traffic of surface streets and bridges and traveling seamlessly between the European and Asian sides of the city. Aboard the Mazu 42 ST this commuting will be carried out in luxury, comfort, safety and style, making each voyage a highlight of the day. 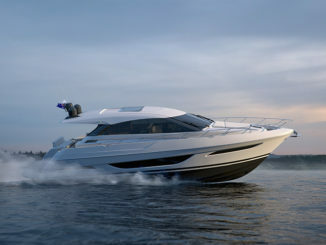 Since 2011, Mazu Yachts has designed and produced luxury motor yachts in both hard-top and open styles. 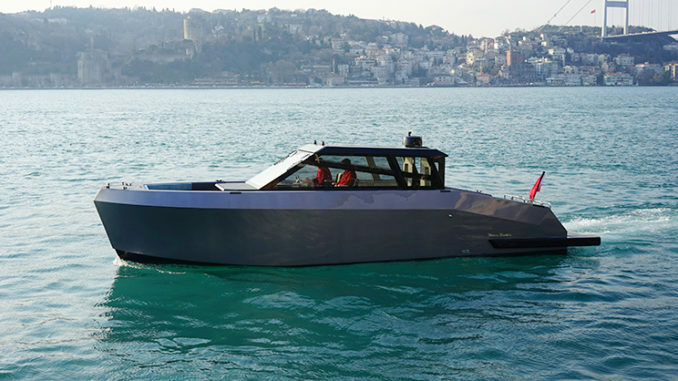 The builder’s designs have striking lines: both sleek and angular, with a hint of military style, and can be customized to accommodate the needs of each individual owner: The Mazu 42 ST is just such an example. 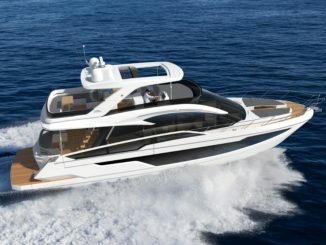 Mazu Yachts has always set itself apart with its cold-molding techniques, which gives the hulls extra strength and light weight, truly living up to its vision for the hand-crafted art of superyachts. The new Mazu 42 ST has an overall length of 41 feet (12.20 meters) and a maximum beam of 12 feet 1 inch (3.7 meters), and indeed is built on the proven running-surface design of the builder’s 42 Walk-Around model introduced at the Cannes Yachting Festival in 2017. Mazu Yachts welcomes the modification of the design to an owner’s specification, which is how this yacht came to be. Mazu 42 ST will help spread the idea of commuting around the waterfront and riverbanks of cities in Europe and around the world with its unique combination of utility and style. 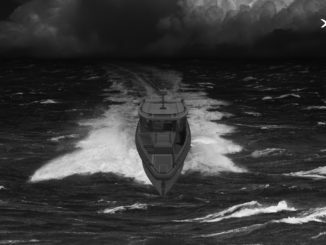 The Mazu 42 ST will have a fully enclosed deckhouse around the helm station and passenger area, surrounded with large windows and featuring the steeply raked, single-flat-panel windshield that helped distinguish the design of the previous model. Elevated helm and companion seats give excellent all-around lines of sight, with a pair of facing settees abaft to accommodate passengers when conditions warrant. Like the Walk-Around, the Mazu 42 ST has deep bulwarks and a high-sided hull to keep hercrew safe and handle a variety of sea conditions, while retaining that contact with the seathat inspires boaters. Wide walkways to either side of the deckhouse ensure that crew can move fore and aft with confidence. In the bow area, a wrap-around settee forward isserved by a table on a hi-lo pedestal that allows the table to support a filler cushion to create a lounging area. A companionway on centerline between the helm and companion seats directs passengers to a lower-deck stateroom with a double berth positioned to port. A head compartment forward is situated athwartships. 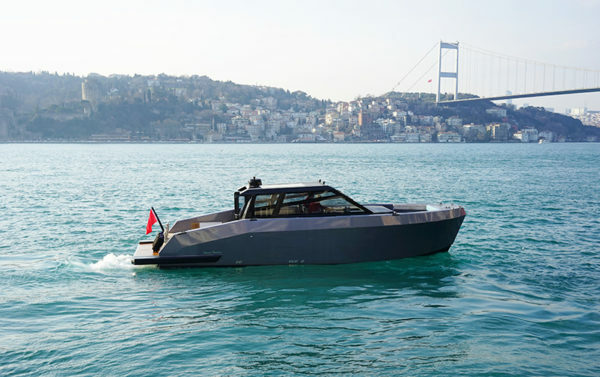 Halit Yukay, head designer and owner of the yard, understands the benefits of commuting in comfort, and the elegant minimalist styling of other Mazu Yachts translates well to the Mazu 42 ST, with an interior highlighted with Alcantara and leather trim created by the Italian company Foglizzo. One key to setting the mood is, lighting, which is provided by Cantalupi for on-deck and interior spaces to create a calming and refined vibe.The aft platform is long and wide, to helpsimplify boarding and disembarking. Across the transom, a rack to hold fenders allows for easy deployment and stowage during frequent docking and departing, a sensible solution.The Mazu 42 ST is powered by twin 435-hp Volvo Penta IPS600s, which offer efficiency and performance at sea as well as around the dock thanks to joystick control. The Mazu 42 ST has a cruising speed of 32 knots and a top speed of 47 knots, ensuring her owner will be punctual for appointments around Istanbul as well as dinner and club reservations.